Here lies the WORST Easter candy. The all caps is justified by the very strong opinions we hear. Easter is already just around the corner and the opinions are coming out again. You've heard the complaints and even had some of these in your own Easter basket. 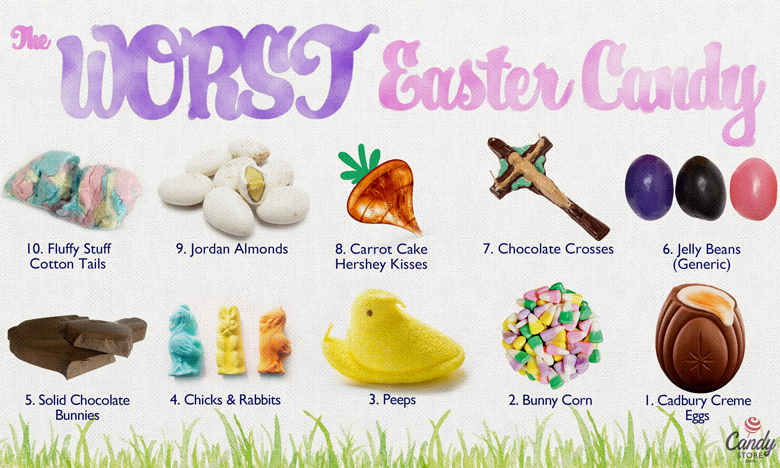 Here are THE worst Easter candies. Followed by the BEST ones. Easter is a giant candy holiday. Did you know more is spent on candy for Easter historically than for Halloween itself? Depending on whose data you look at, Easter is as big or bigger than Halloween. The National Retail Federation says Easter candy spending will be $2.49 Billion this year, down slightly from last year’s $2.63B. Of the people who do not plan to celebrate Easter, 33% will still buy Easter candy. That says a lot. There is some good stuff out there, people. But there is also some pretty bad stuff. We know because you’ve told us loud and clear what you don’t like. As we mentioned before, you have to be careful when asking people about their least favorite holiday candy. It stirs up some deep emotions that can come out in an unfiltered rage. 81% of them will steal some candy from their kids’ baskets. When we did our Easter season surveys, we asked a whole lot of people about their favorite and least favorite Easter candy. We got 23,000 responses. The results, as well as some of the respondents’ optional comments are included below. Fluffy Stuff cotton candy is a popular brand of packaged cotton candy. If you like cotton candy, it’s good cotton candy. I personally am neutral on the stuff, could take it or leave it. The people in our survey were not as neutral. Cotton candy is not their favorite, to put it mildly. More than that though, there is a strong sentiment that it doesn’t belong in the family of Easter appropriate candies. I can appreciate that. It does feel a little gimmicky to take your cotton candy product and call it a rabbits tail and market it for Easter. That may not be terribly different from what a lot of candy products do, but it does feel a little forced here. Nice try cotton candy tails. You’re still just dirty cotton candy. I can’t deal with the weird texture of cotton candy. It melts in your mouth and at the same time gets kind of rough and sandy. No thank you. Those cotton candy bags where they call them bunny tails. That’s not an Easter candy. Ugh. 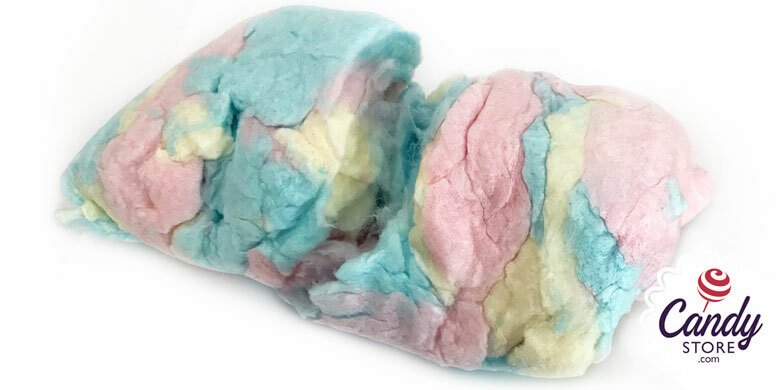 Cotton candy that they try to make seem like its supposed to be normal Easter candy. Stay away from my Easter baskets, cotton candy! Jordan Almonds have a very Easter-friendly aesthetic. Shaped pretty much like an egg, soft in tone and very frequently pastel colored. The hardness, however, is decidedly not egg-like. Many comments came back about how Jordan Almonds are hard as rocks and uncomfortable to eat. They do look great on display, but don’t play nicely in an Easter basket where a plastic grass bedding leaves lots of openings for the Jordan almonds to fall through. You could put them inside a plastic egg, but that would be squandering their best (only?) good quality, their appearance. If I wanted to risk cracking a tooth, it’d be on something better than a Jordan Almond. Are jordan almonds even edible? Very pretty, but I need chocolate with my nut candy. Easter Bunny should not be wasting precious basket space with *@^%# like jordan almonds. A few years back, Hershey’s came out with a new springtime / Easter themed version of their legendary Hershey Kisses. Sometimes, you try something and it works. Other times, there is Carrot Cake Hershey Kisses. They were not well received. I like the idea, but I think in reality an orange Hershey Kiss, looks a little off. People also were not fans of the “light cream cheese-like filling” inside. The wrapper is kinda cute if you think of it as an upside down carrot. But I need more. Someone at work was passing these around. More than one co-worker could be seen gagging. Are we supposed to think the orange is made of chocolate? If it’s not, then what is it made of? Bunny tears? 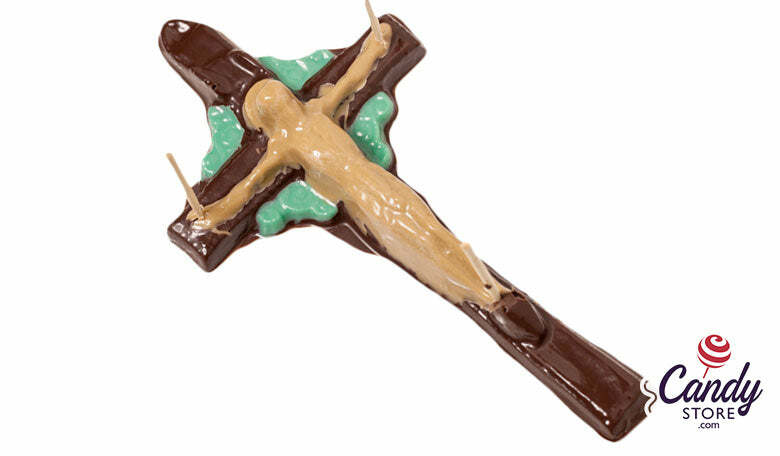 Chocolate crosses have become an increasingly popular – but possibly not so well received – Easter candy. Much of the backlash seems to come from people trying to square the idea of turning a torture device into a yummy chocolate treat. I have to admit, this one always seemed a little forced to me. I get the whole “reason for the season” movement that some of the more traditional believers have hung their hat on. I do. I grew up in that world. Perhaps that motto works better at Christmas time, when there was no torture. Just a little frankincense and myrrh. These always come with a side bludgeon of guilt from grandma. Am I supposed to be sad while I eat my chocolate treat? I can’t decide if their just morbid or disrespectful and morbid. I do like chocolate though. How deep you wanna get? Where are the chocolate nails with raspberry blood stains? Bunnies people, not crosses. Crosses at church, bunnies in my Easter basket. 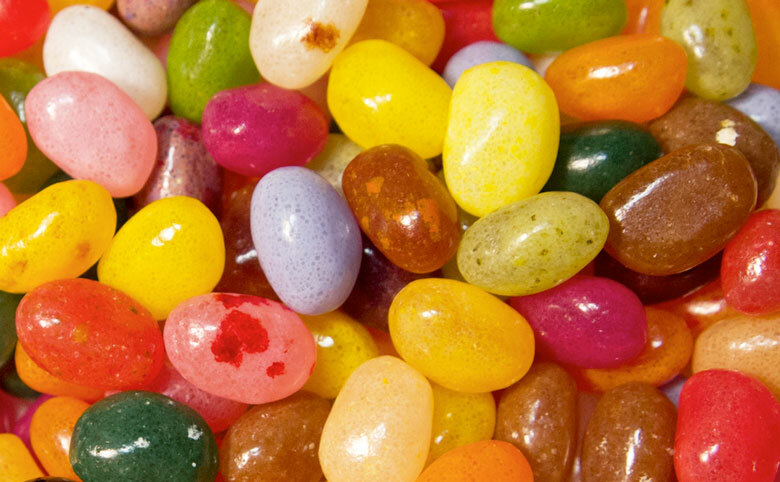 Jelly beans come in many different flavors from many many different manufacturers. They are not universally hated for Easter. it’s just that people prefer higher quality jelly beans these days. The days where you could plop any old jelly bean down into the grassy Easter basket might be gone. It’s the fat jelly beans that are the slouches. That’s how you know to let a jelly bean lie. Its wasteline. Those off-brand, dried out looking jelly beans are always either cracked or look like they’re ready to crack. Those jelly beans that are almost colorful, but someone like put a hazy photo filter on them to dull the color…and the flavor. Jelly beans gotta be quality, none of that grandma junk. Chocolate bunnies are one of the most iconic Easter candies. So what gives? Solid chocolate bunnies are a buzz kill. You see a chocolate Easter bunny and think how fun it will be to devour it. The thing is, solid chocolate Easter bunnies (as opposed to hollow) are just too much darn chocolate. It’s demoralizing. Here’s this giant, dense brick of chocolate. Yes, it’s shaped like a bunny, and it’s cute. After one bite, enticing turns to intimidating. You realize there’s no way you are going to devour this thing. 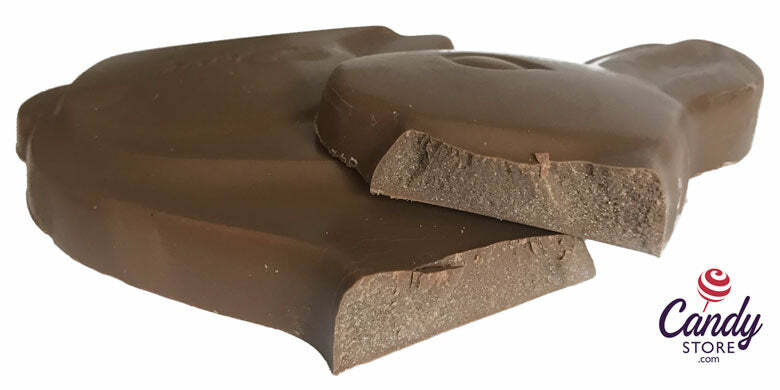 The one pictured above is 12 ounces (340g) of chocolate. A regular-sized Hershey Bar is 1.55oz (43g). That solid chocolate bunny is equal to nearly 8 whole Hershey Bars (7.9, to be exact). Could you eat 7.9 Hershey bars? Probably not. You pull the foil back up over the quarter-eaten bunny ears and long for the time before you made such a foolish attempt on a solid chocolate bunny. A time when your Easter Fun momentum was still on the rise. These things are monsters. No one has actually ever finished one. Fact. I love chocolate bunnies, but the solid ones are a waste of chocolate. I always feel defeated when I try to eat one. I don’t bother now, but receiving one as a gift makes me feel guilty. I guess that feel is natural for us Catholics. Solid chocolate bunnies are insanity. I actually quite like these. It seems like most people are comparing them to circus peanuts. Circus peanuts are not good company to keep, if you’re trying to be popular. They were the #1 worst Halloween candy. Also, they don’t really look like chicks or rabbits. They kind of look like aliens. Marshmallows are supposed to be soft. These are not soft. Not good to eat or look at. Why, then? Ok, you sneaky circus peanuts, I know it’s you. You and your stale squish and your overly sweet, weird flavor. More like snicks and snabbits. Peeps are a regular on our WORST holiday candy lists. They just don’t get much love outside the diorama art world. They tend to get compared to rubber or sugary foam in the comments we received. They don’t seem to be a thing that many people want to associate with putting inside their bodies. Put it on a doughnut, however, and they might sing a different tune. How horrible are Peeps! Haha! They’re just trolling us at this point. There’s a special Peep for every day of the year it seems. 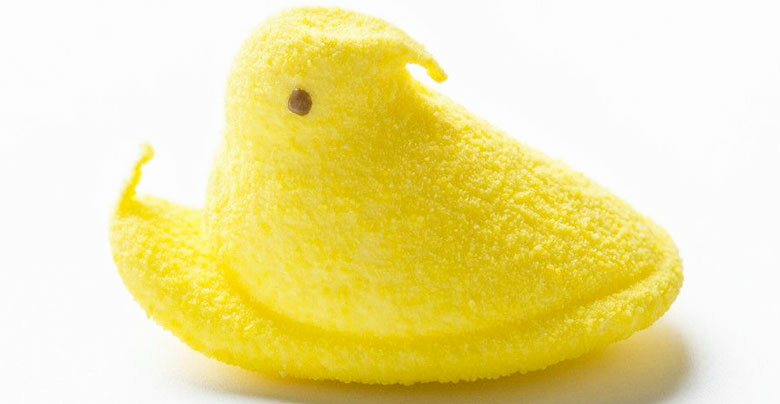 Peeps are just sugar shaped into a cute shape but with a weird texture that doesn’t say “this is food”. Can be hilarious when decorating baked goods with funny settings. But I ain’t gon EAT it. Candy corn always places highly among the disliked candy, but can often also place highly on the most liked list. It’s a highly disputed candy type. For Easter, it seems the hoard have chosen to dislike. I am a confessed candy corn lover, but I will admit the pastel coloring does give me pause. I’d still eat it though. Here we go again, candy corn changes some colors and we’re supposed to forget they’re nasty. I do not like you, candy corn, I do not like you, not one bit. Candy corn is candy corn. Dress it up however you like, its wax yucky nuckness. No no no. Candy corn I cannot. 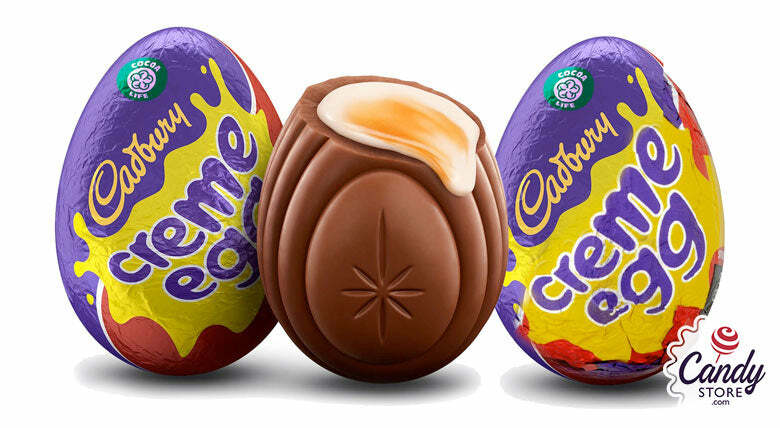 As Easter candy goes, Cadbury Creme Eggs are one of the most well-known candies ever. There were the classic old commercial where the clucking bunny lays an egg and it’s a Cadbury Creme egg. A whole generation thought rabbits clucked after this …and laid eggs. You gotta give Cadbury credit, there is cultural cachet there. Cadbury Creme Eggs are a highly unique candy. 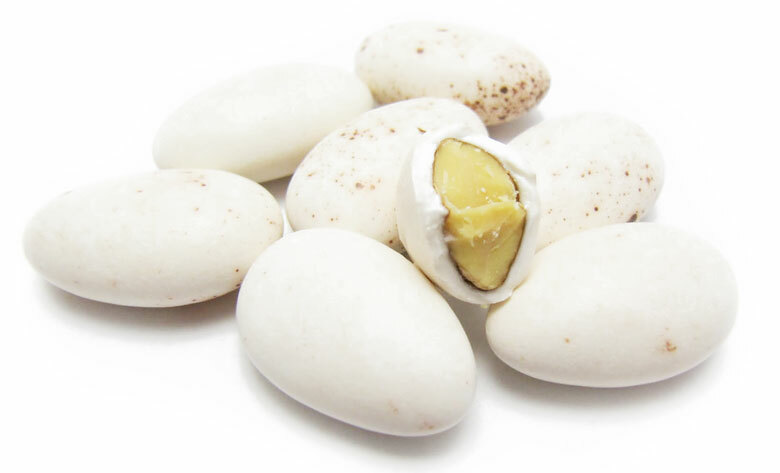 Chocolate shell with a creamy and sugary goo inside that has both the white and the yolk of the candy egg. It seems like a confectionery engineering marvel. Bravo for creating such a work of candy art. The thing is, they’re just awfully horrible to actually eat. The chocolate shell is a problem. The thing is hard enough to eat without making a mess, but god forbid the egg has gotten a tiny bit warm and the outer shell has softened. Then you’re in for a sloppy mess with this awkwardly shaped candy whose liquid filling does nothing to support its shape. It falls apart into goo. People were not happy about that. They even started a petition to go back to the old recipe. But the liquid filling is the thing that people seem to have the most problem with. It’s liquid fondant, which ok yeah that sounds gross. Its consistency apparently leaves more than a little something to be desired to most people. I used to get really excited for these when I was a kid. They either changed a lot, or I did. It’s kind of sad how revolting they are to me now. Its the goo inside. That [stuff] ain’t right. They are weird to eat. The flavor is not horrific, though not good either, but it’s just a total mess. There’s no good way to hold it. Oh no no no. What even is that stuff inside? It’s like a runny egg, but who wants to eat a raw runny egg from the shell?! My sister loved these as a kid. My mom made her eat them with a knife and fork because they made such a mess. It’s brilliant marketing. Fun concept. Don’t come near me with one to eat though. Puke. Cadbury Creme Eggs aren’t the only Easter candy made by Cadbury. It’s the worst, but they also happen to make the very best. It’s no surprise that Sour Patch Kids are hugely popular right now. Sour candy and spicy candy have both gone through a resurgence of late. 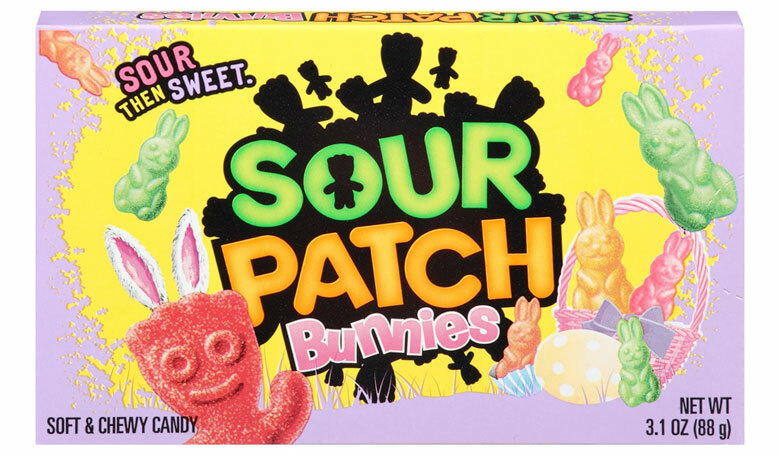 These Sour Patch Bunnies are well received has plastic Easter egg fillers. A good change of pace from classic, but often generic, jelly beans (see above). 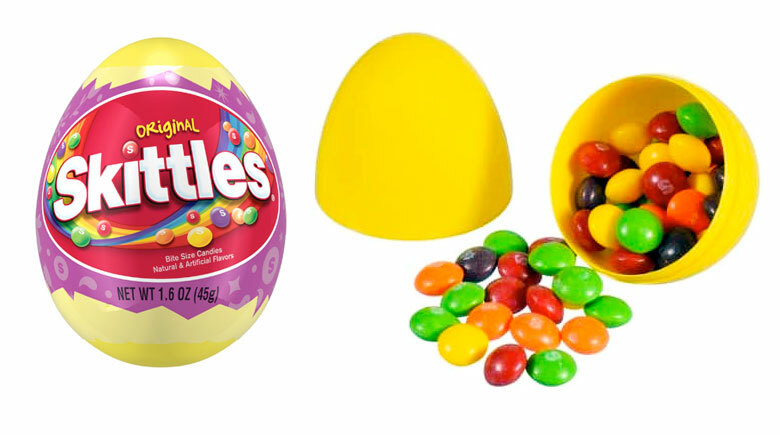 Similarly Skittles Easter eggs combine the fun and re-sealability of candy in a plastic Easter egg, with the desirability of not being generic jelly beans. Skittles are a very popular candy overall. They finished as the #1 overall top Halloween candy last year. Kids love Skittles and they love Easter egg hunts. Get on board with these Skittles-filled eggs. These might be my number one top favorite. I love the foil wrapped chocolates, especially when they have some candy crunchies inside. The cookies and creme variety are extra points. Quick little hit of crunchy chocolate and I’m on to the next piece of candy in my Easter basket. The only drawback is they can be messy if they are eaten warm. Jelly beans did really well when they distinguished themselves as being gourmet or made with natural flavorings. Basically, any fancy jelly beans work well. You can tell the difference usually by the size. Nice jelly beans tend to be on the smaller side. The flavor difference is gigantic though. The vibrant flavors that come out of naturally flavored, or gourmet jelly beans, like Jelly Belly are great. Kinder Eggs haven’t been in the Easter candy lexicon very long, but they’ve made a huge splash. 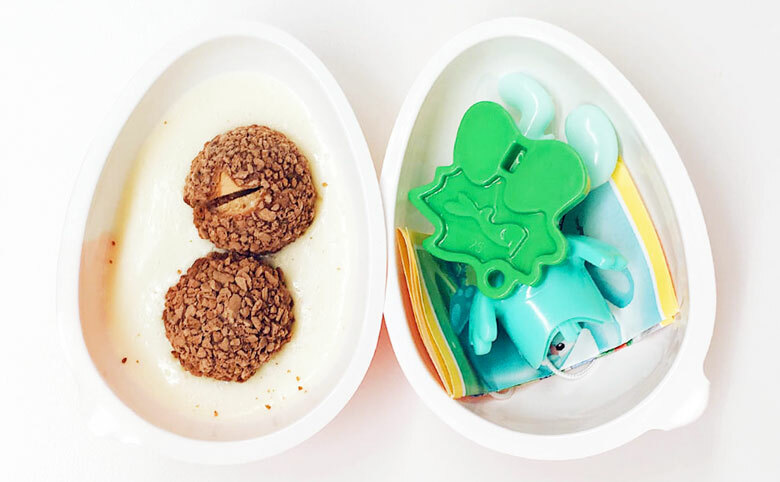 Kinder Joy Eggs only recently became available in the US, but they are a candy giant in Europe and the rest of the world. Who doesn’t love a surprise toy inside of anything? And when that thing is yummy chocolate-y wafer balls floating in creamy candy goodness, it’s a win win. Robins Eggs are little Whoppers malt balls shaped like eggs and covered with a crispy candy shell. The shells are colored with speckles to look like little robin eggs, except that robins’ eggs don’t typically come in yellow and coral colors, so far as I know. These are crunchy and satisfying. You can put them inside a plastic Easter egg for a nice surprise or sprinkle them into the Easter basket individually. Very nice. Lindt Chocolate Carrots are delightful. 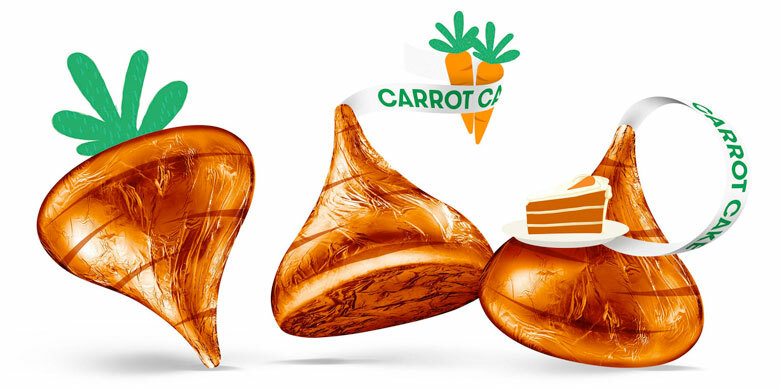 Foil wrapped chocolate carrots are designed to look like little carrots. They look devine in an Easter Basket and the flavor is nice too. Lindt is known for quality, and these chocolate carrots have hints of hazelnut to give them a warm and fuzzy feeling. The little curve at the end of the stick makes them feel like little spring carrot umbrellas. So cute. Reese’s Peanut Butter Cups are an absolute juggernaut in the candy world. These are like those, except shaped like an egg. Yeah, that’s about it. Pretty awesome. Here is the quintessential Easter candy. The chocolate bunny. Tale as old as time, well at least the 19th century. The story goes that there was a German goddess named Ostara, who was the goddess of spring and fertility. Her name is thought by some to be the origin for the very word Easter. In German, the word for Easter is Ostern. Anyway, there is a myth about her turning a bird into a bunny to save it, so there you have the Easter Bunny. That was hundreds of years ago. Chocolate bunnies are slightly more recent. You can find molds for chocolate bunnies in Germany that go back to the 1890s. They were also being made around that time by some Pennsylvania Dutch, one in particular named Robert L. Strohecker. It’s fun, it’s big, it’s festive, and it better be hollow. Hollow chocolate bunnies are all the fun without any of the hard work or guilt involved with trying to eat a solid chocolate bunny. I need to have a big chocolate bunny at Easter! I eat the ears first. My husband eats it from the tail, I think just to mess with me. Gotta be the hollow ones, but a chocolate bunny is what Easter is all about. They may not have the history of chocolate bunnies, but Cadbury Mini Eggs are hugely popular. They were far and away the most popular Easter candy in our study. There is just something about these little eggs that is irresistible. Is it the softness of the outer shell to the touch? Maybe it’s the way the shell holds strong to the bite for a moment and then gives way to a soft and yummy chocolate center with a satisfying crunch. The flavor of the shell and chocolate combined has a specialness to it that I can’t quite put my finger on. Why is it so darn good?! It just is. Really good. They are infinitely better than their Creme Egg bretheren. And they have their own cute commercial too. As amazing as they are, they are not without some controversy. A few years ago, Cadbury altered its packaging, and the word “Easter” was no longer on the front of the bag. Some people were outraged, and accused Cadbury of deliberately downplaying the relgious aspect of the holiday. Whatever you think of that, it’s hard to deny that Cadbury Mini Eggs are delicious. We fight over Cadbury Mini Eggs. The mini eggs from Cadbury are so frickin good. My favorite part of Easter. I don’t know what my number 2 candy is, but number one is Cadbury Mini Eggs. There you have it folks. 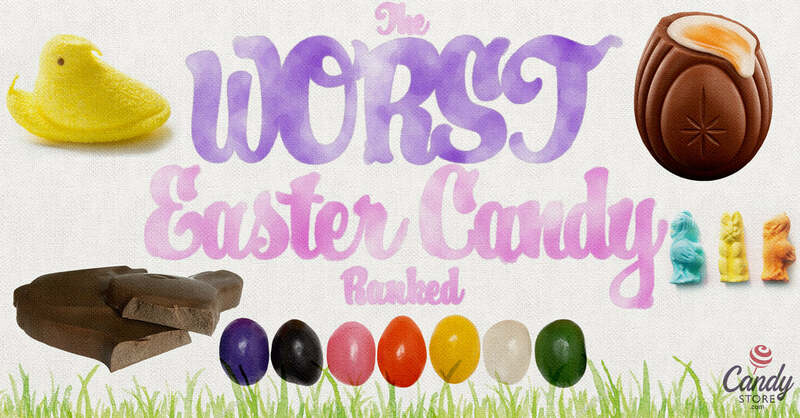 Cadbury makes the #1 Best and the #1 Worst Easter candy. Whatever your thoughts about Easter candy are, they likely include thinking about Cadbury’s brand. Winner of Easter: Cadbury.